Since becoming ill and poor I've been unable to go out much - but sitting here watching Children in Need by myself just tops it all for aloneness. In the past I've joined in silly activities at work or in the pub but here at home who will notice if I wear my pyjamas or dance along with the celebrities. I can see the rest of my life stretching out in front of me a bit boring and studious. I'm keeping busy going to Barnsley Archives and transcribing things, attending Cudworth Local History and Heritage meetings at the local library and doing Open University study (well, for seven more months anyway). But what happened to the fun? Tomorrow my Great British Beer Festival friends are meeting in London to plan next year's festival. I won't be there, at the meeting or at the Festival. I've had to retire due to ill health. 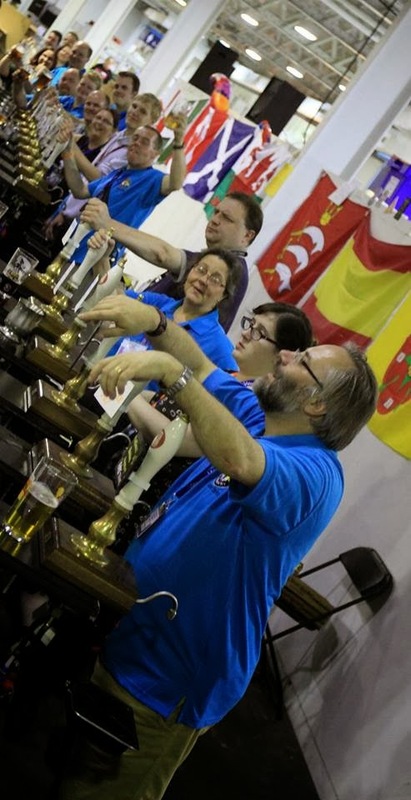 The picture on the right shows us all serving at the staff bar on the last night of the Festival this year. That's my daughter on my left and the OH second on my right. Everyone in the picture is a long standing friend and I will miss them. I was looking forward to going to an Open University tutorial in Leeds tomorrow, but my tutor has been taken ill and has had to cancel. My disabled travel pass lets me get to Leeds for free, last year my tutorials were in York which was just too far to travel and outside the area for my pass so I attended no tutorials at all. I have been looking forward to this year's - it's a great chance to meet like minded people and talk about history in an academic way. At least there's still the Facebook groups and the OU forums, I can still talk to people online - but it's not like meeting them face to face I'm afraid. Even Children in Need is in the pub tonight - the whole of the One Show took place in the Queen Vic in Albert Square. I've watched the Dr Who bit and the Strictly Come Dancing bit and I think Terry Wogan is getting a bit old for doing it all now. The joke about being a younger partner for Tess than Bruce Forsyth was good though. Is there anything else worth staying up for? Ah, Brian Blessed just did a 'Coming Soon' and the answer is no not really.